Beth wrote to say a couple weeks ago she was talking to a lady about buying a horse but she felt she was given conflicting information. "Hi, a few weeks ago I as texting back and forth with a woman about her horse she was trying to sell. It was an eight year old mare. She told me that she used the horse for barrels and poles and that her daughter could even ride this horse. In her Facebook ad where I first saw the horses, she listed that the horse 'trailers, stands for a farrier and for washing, and was gentle enough for children to ride'. I was looking for a well broke pleasure horse as I am not a trainer so I thought the horse's description sounded very suitable. The woman said she could bring the horse to me if I bought her. I wanted to look at the horse first so I made an almost two hour trip to see the horse. When I arrived at the farm the mare was standing in her stall and there were about 10 other horses in stalls as well. So the woman led her out. The mare, kind of a spotted white and cream color, had a pretty big scar on one of her back legs although she did not walk in anyway in a odd manner. But the big thing that made me decline to buy the horse, yes a wasted trip, was that while on the lead line that horse would not stand still and did not appear to be broke very well. The woman said I could ride her if I wanted, but I declined and left telling the woman I would have to think about it. I felt almost like I was deceived and am wondering what I can do and what questions I could ask to eliminate more wasted time. Thanks!" Hey Beth, unfortunately the words "buyer beware" are pertinent to trucks, horses and mail order brides. 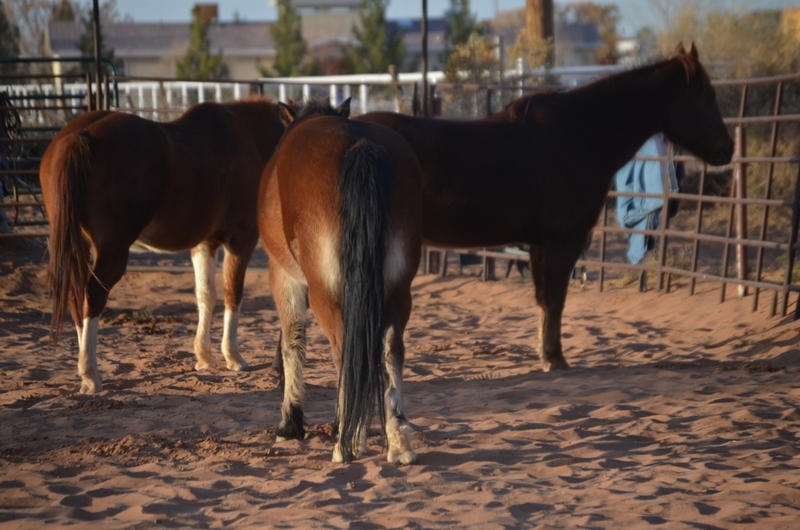 Buying a horse is no small undertaking as I'm sure you know with the purchase cost often being the small end of the expense train. You have to be good about reading between the lines and seeing what is not being said - and that's only to get through the first gate so to speak. In your case the woman said "(the mare was) a horse that her daughter could ride - not that her daughter did ride the horse. 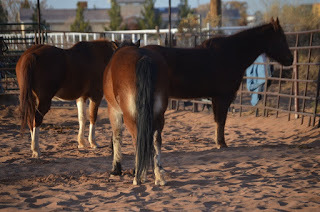 I reckon there are some people who make the first priority of downsizing their herd and the second priority being completely upfront or matching horses with prospective owners. When my wife or I go to assess a horse to buy, we talk with the owner, trainer or whoever has been riding that horse. 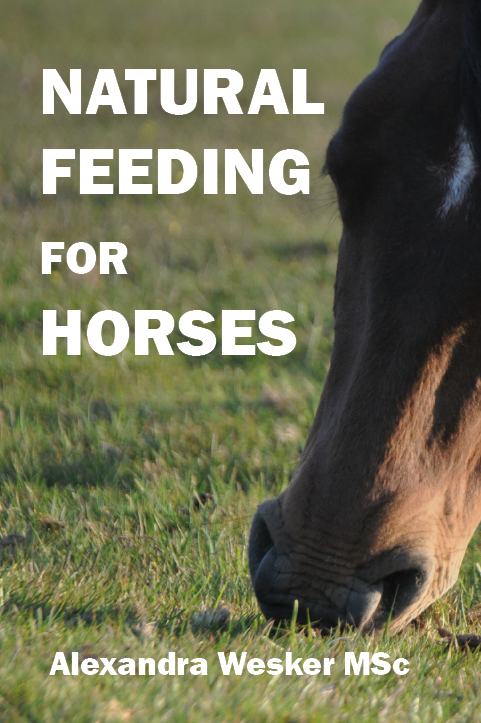 Usually we're asking: what the horse has been used for; how does he lead; how the horse performs; what his idiosyncrasies are such as bucking or being cinchy; does he stand to shoe, wash and clip. And why are you selling this horse? We do this before we ever make a trip to see the horse. Like you found out when that mare was on the lead line, the most important thing is to let the horse tell you what she is about. Talking to the owner, trainer or rider doesn't necessarily prepare you for how the horse is, and the owner's opinion is often better served by telling so you can figure out why that horse is the way he is. It would likely be a good thing if the seller could send you a video on the horse being ridden before you make a trip. 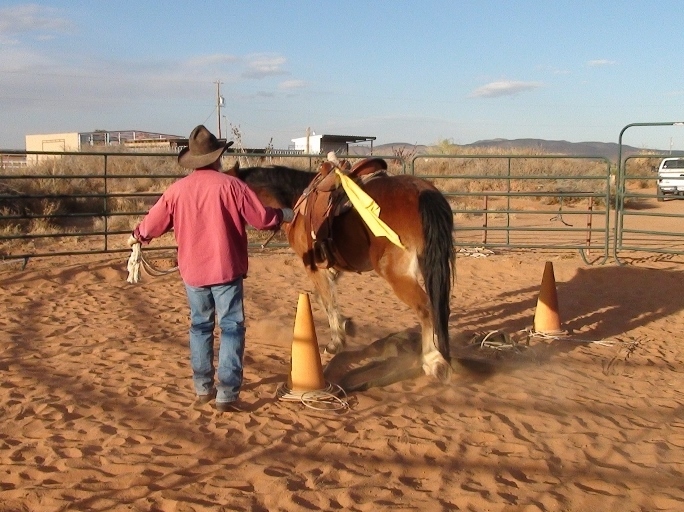 The video wouldn't need to be a full length feature movie, but seeing the horse under saddle, stopping, turning, backing and such would help you evaluate if you should go her the horse in person. Even then I have seen many horses being ridden in local Gymkhanas and other events that are simply not well broke to a lead rope. The good thing is that this can be assessed up front and usually fixed if you take the horse home. I'll usually bring a 14 foot lead line and attach that to the owner's halter and ask the horse to lead up. To see if he can follow the feel of a lead rope, stop when I stop and how much attention he is paying to me. On someone's else's horse, I won't try and correct too much, maybe just a short bump on the lead when the horse's attention goes elsewhere. Why wouldn't you do this before you get into the saddle? I'll lunge a horse around in a small circle. If the horse takes off immediately at a lope it doesn't mean too much initially to me. He may have been not handled too recently and is full of it. Maybe he has never been lunged. But a saddle horse will figure it out very soon and you'll see a change pretty quick. Asking them to disengage their back end, stop and face up and the horse's body language can tell you some things too - whether he is paying your attention. Will he follow the lead and walk to you? Can you back him up on the lead? If you are riding a horse as a prospective purchase, the owner will usually put a saddle on him and bit the horse up. Notice how he/she does that. 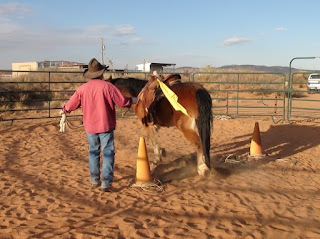 It may account for some behaviors of the horse especially if the ears are mangled when bridling, or the bit is seated way too deep where the horses can get any release or carry the bit comfortably, or even if they are using a harsh bit or the bit is pinching the horse's mouth. All not so uncommon, I think. I am not saying that you lost an opportunity to get a good horse because I wasn't there. But when I bring in a new horse, I'm not going to assume he knows anything. I'm going to start the horse all over on the ground. We may progress pretty quickly, but again it'll let me see what the horse tells me about how he has been handled.